Phase separation of poly(acrylonitrile–co-methacrylic acid) in compressed liquid CO2 resulted in formation of a porous imprinted membrane which preferentially adsorbed uracil (URA). The cross-section of the membrane was observed by SEM, which revealed its porous structure. The mechanical strength of the membrane indicated formation of a rigid matrix with high tensile strength (4.4 N mm−2). The imprinted membranes bound highly selectively to URA (12.8 μmol g−1) but binding to dimethyluracil (DMURA), thymine, and cytosine was less (0.7, 0.8, and 0.9 μmol g−1, respectively). When DMURA was similarly used to prepare an imprinted membrane in liquid CO2 there was less binding of DMURA to the imprinted membrane obtained. The URA-imprinted membranes were evaluated by IR spectroscopy before and after URA extraction. The results indicated that hydrogen bonding was the mechanism of binding of URA to the imprinted membrane. 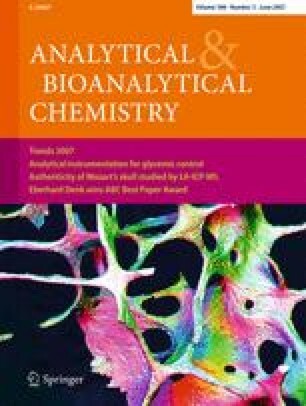 Competitive binding studies were performed with binary mixtures of URA and its analogues. The URA-imprinted membrane enabled good separation of URA from cytosine, DMURA, and thymine, with separation factors of 3.0, 3.8, and 2.5, respectively. It was confirmed that the compressed liquid CO2 contributed to efficient formation of template substrate sites in the URA-imprinted membrane. This work was partially funded by the Japanese government (Grant No 1530034 for scientific research (B)). The authors gratefully acknowledge the JASSO short-term student exchange promotion program (2004) for one of the authors, Quanqiu Zhang. The authors are grateful for financial support by the 21st century COE program, Japan.